Julie Amador is a painter/photographer who specializes in pet portraits. She lives in Baton Rouge, LA, with her husband John and their menagerie of animals. She graduated from Louisiana State University in 1998 with a Bachelor’s in Fine Arts and a Minor in English Literature. She actively volunteers with local animal rescues and uses her art to help animals find homes by providing professional photos of them at no charge. After completing college Julie did not pursue art until 2010 when, while out of work, she wanted a way to give back to her local animal rescue. So, she picked up her brushes and began painting pet portraits of recently adopted animals. She then sold these to the adopters and donated the money to the rescue organization. Through word of mouth she gained more and more attention for Pet Portraits and stays busy with commissions. Besides her pet portraits she creates large abstract pieces. Another one of her passions is photography, especially animals, nature, astrophotography, black and white film photography, macro-photography and landscapes. She enjoys travelling and documenting the beauty of the world around us. 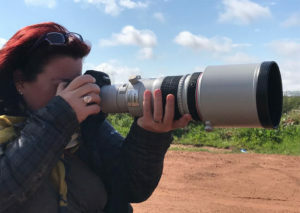 She further expands her knowledge in the field by taking photography classes and currently studies under Amy Shutt Photography.